So much for retirement – from the boxing ring, that is. Floyd Mayweather, who recently celebrated his 41st birthday, has informed the media how he is back in the gym, training for what he says he hopes will be his MMA debut this year some time. “Money,” who as fans know is 50-0 in boxing, will fight his MMA debut at 154 pounds – the weight class of one Conor McGregor. Speaking with his favourite boxing website, FightHype.com, Mayweather said he has began working on his endurance. It seems then, that Floyd is indeed serious and willing to try and get himself a fight inside the cage. It would of course be a huge event, a big money-spinner, if Mayweather did fight in MMA – against just about anybody. But imagine how big a rematch with McGregor would be. 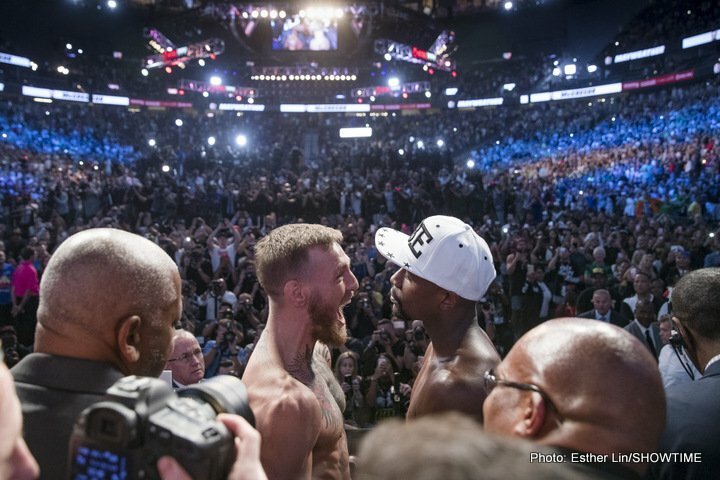 Mayweather of course defeated the Irishman in a hugely publicised boxing match last August, and McGregor has said ever since how Floyd “owes him a fight on his turf,” as in, inside The Octagon. Mayweather never gets out of shape, and he often visits the gym merely to get a workout, so his being back in the gym doesn’t mean he will fight again. And, as has been pointed out before now, Mayweather misses the limelight after a while and he is maybe talking merely to keep his name out there. We simply don’t know. As Floyd says himself, it’s 50-50. But you’ll watch if Mayweather does fight again, won’t you.